Much of the Middle East’s recent turmoil stems from internecine Middle Eastern rivalries spilling onto third country battlefields and Saudi and United Arab Emirates-led efforts to roll back the achievements of the 2011 popular Arab revolts and pre-empt further uprisings. This week’s successful toppling of ailing Algerian president Abdelaziz Bouteflika and months of anti-government demonstrations that have put Sudanese leader Omar al-Bashir on the defensive suggest that the Saudi-UAE effort may be faltering. So does the record of the past eight years. The counterrevolution’s one success, Egypt, has produced some of the harshest repression in the country’s history. Saudi and UAE intervention in Yemen has sparked one of the world’s worst humanitarian crises, tarnished the image of the two Gulf states, and provided an opportunity to Iran to expand its network of regional proxies. In a twist of irony, Saudi Arabia, the UAE, and Egypt, who justify the Yemen war by pointing to an invitation by the internationally recognized exile government of President Abd Rabbuh Mansur Hadi, support the rebel forces of Field Marshal Khalifa Haftar in Libya. Mr. Haftar’s forces are poised to march on Tripoli, the seat of the United Nations-recognized government of Libya, two weeks after the field marshal met with King Salman in Saudi Arabia. The fighting in Libya has turned into a proxy war between Gulf rivals with Qatar supporting the Islamist-dominated Tripoli government. In Syria, rivals Saudi Arabia, the UAE, and Qatar, who exasperated the country’s eight-year-long devastating civil war by backing rival rebel forces, are back to square one: the man they wanted to remove from office, president Bashar al-Assad, has gained the upper hand with the support of Russia and Iran. Like in 2011, protests in the Middle East are not isolated incidents but the most dramatic part of a more global wave prompted by a loss of public confidence in leaders and political systems that have sparked anti-government demonstrations in countries as far-flung as Zimbabwe and Haiti. The Algerian and Sudanese protests come on the back of a wave of smaller, political and socio-economic protests since 2011 that suggested that the Middle Eastern counterrevolution amounted to putting a lid on a pot that could boil over at any moment. Protests have erupted in recent years in a host of countries, including Iraq, Morocco, Jordan, Lebanon, and Tunisia. The protests also suggest the fragility of hopes of Middle Eastern autocrats that China’s model of successfully growing the economy, creating jobs and opportunity, and delivering public goods coupled with increased political control and suppression of rights would prove to be a sustainable model in their own backyard. The fragility of the model is enhanced by the tendency of autocrats to overreach in ways that either distract from their core goals or pursue objectives like the creation of a ‘new man’ that ultimately have failed in countries like Turkey. Turkey’s Islamist Justice and Development Party (AKP) has been in power for the better part of two decades. Its success suggests that the effort to create a secular New Turk by Mustafa Kemal Ataturk, the visionary who carved modern Turkey out of the ruins of the Ottoman empire almost a century ago, has stumbled. Egyptian general-turned president Abdel Fattah al-Sisi and Chinese leader Xi Jinping have taken control and civilisationalism to new extremes by seeking not only absolute political power but also the ability to shape culture and dictate personal behavior. Mr. Al-Sisi recently ordered his officials to dictate the themes and scripts of Egyptian soap operas, a popular regional staple, particularly during the holy month of Ramadan. A military-linked production company has taken charge of some of Egypt’s biggest and most successful shows. Film directors have been instructed to focus on shows that praise the military and law enforcement and demonize the Muslim Brotherhood, a group that has been brutally targeted by Mr. Al-Sisi as well as the UAE that together with Saudi Arabia backed his 2013 military coup. The coup toppled Mohammed Morsi, a Brother, and Egypt’s first and only democratically elected president. Mr. Xi’s hopes to promote ‘core socialist values’ such as patriotism, harmony, and civility amounts to an effort to counter individualism, materialism, and hedonism. The campaign involves blurring piercings and jewelry worn by male pop stars during performances on television and the Internet, obliging soccer players to wear long sleeves to cover their tattoos, and ensuring that women conference hosts raise their necklines and rappers restrict their lyrics to the promotion of peace and harmony. Analyst Giorgio Cafiero predicts that in the wake of Mr. Bouteflika’s resignation, Saudi Arabia is likely to support efforts to maintain control by what Algerians call Le Pouvoir (The Power) or the deep state, a cabal of military and security officials and business tycoons, The same is likely to be true for the UAE. Similarly, Saudi Arabia and the UAE alongside Egypt continue to back Mr. Al-Bashir although he is on the defensive after months of protests that have rocked the East African state. 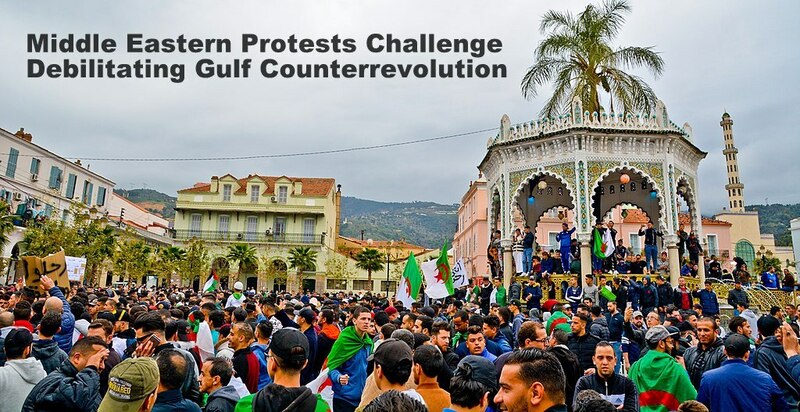 Whether Algeria’s ancien regime backed by Gulf states is able to retain power may well be dependent on what conclusions protesters draw from the experience of the 2011 revolts. Like the protesters then, Algerian demonstrators need to decide whether Mr. Bouteflika’s resignation is a sufficient enough success to justify the surrender of their street power and return to a structured political process. Indications are that the protesters have learned their lesson. "Algerians are very realistic. This is a beautiful victory, a tangible first step but they know that more has to be done. They are not satisfied entirely ... they want all of them to be gone," said Algeria scholar Dalia Ghanem. "Algerians are calling for radical change, a change in leadership. They didn't want Bouteflika, they don't want Bouteflika's family or Bouteflika's clan -- and they don't want the old guard to stay in power," Ms. Ghanem added. A podcast version of this story is available on Soundcloud, Itunes, Spotify, Stitcher, TuneIn, and Tumblr. Dr. James M. Dorsey is a senior fellow at the S. Rajaratnam School of International Studies, co-director of the University of Würzburg’s Institute for Fan Culture, and co-host of the New Books in Middle Eastern Studies podcast. James is the author of The Turbulent World of Middle East Soccer blog, a book with the same title as well as Comparative Political Transitions between Southeast Asia and the Middle East and North Africa, co-authored with Dr. Teresita Cruz-Del Rosario, Shifting Sands, Essays on Sports and Politics in the Middle East and North Africa, and the forthcoming China and the Middle East: Venturing into the Maelstrom.